The recent dramatic fall in oil prices has been heralded as both a good and bad thing for the world economy. On the one hand, falling oil prices will reduce the cost of energy and transportation fuel helping consumers have more money to spend on other things. This could cause a demand side economic boost. On the other hand, falling oil prices may also impact government budget surpluses of countries heavily dependent on oil as a source of revenue reducing government expenditures and/or creating financing challenges for governments. Moreover, the seemingly promising emergence of shale oil may become economically unviable at oil prices hovering around $50/barrel. More controversially, falling oil prices may provide a temptation for countries to reduce their investments in renewable energies. One sector that should benefit from a cost perspective is the aviation industry. According to IATA data, between 2003 and 2013, fuel cost represented between 14 and 30 percent of total cost for the airlines rivalling labour cost for being the single biggest cost item facing airlines. With the recent decline in oil prices, IATA have further predicted that in 2015, the world’s airlines would report a 26 percent jump in collective net profit. Note the term ‘collective net profit’. This figure doesn’t tell us anything about specific airline performance just that the total profit pool in the industry will rise. A key question therefore is how will airlines react to falling oil prices? • Will they pass on these cost gains in the form of lower prices? • Will they maintain price discipline and bank the increased revenues? • Will they expand their route network as previously economically unviable routes become viable now due to lower prices? Let’s take a quick look at past evidence of airline behaviour when oil prices have changed in the past. 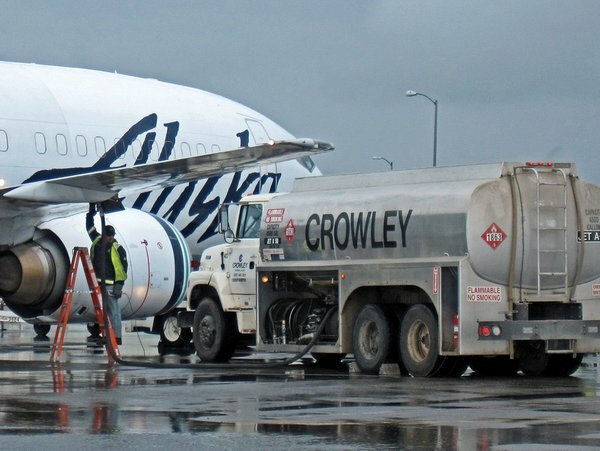 According to industry analysis at OAG, for the big four US carriers, every 1% change in the price of jet fuel resulted in an increase or decrease of nearly $138m in operating expenses. American Airlines took the decision to stop hedging in 2008 and should benefit substantially from the price decline. However in Europe, most airlines hedge two years in advance and combined with the declining Euro (most European carriers earn in euro), it means that the benefits of lower oil prices may be less significant and somewhat delayed. Interesting, fuel hedging only really works if oil prices rise steeply. Most carriers hedge with call options, permitting them to cap their fuel costs without locking them in if oil prices happen to fall. The negative of this tactic is that the airline has to pay a premium for each call option. Unless oil prices rise by a significant amount before the option expires, the airline ends up losing money on the call option. For example, Delta Air Lines reported $347 million in “mark-to-market” losses in 4Q2015 due to the declining value of its fuel hedges. Oil prices have continued to fall setting Delta up for further losses in 2015 unless they can renegotiate their fuel hedges. And here’s the rub: oil producers have just as great an interest in hedging against falling oil prices as airlines do in hedging against rising oil prices by locking in airlines at the current rate (assuming the price may fall further). This would give airlines an opportunity to lock in a portion of its future fuel costs at the current price rather than paying a premium on rising fuel prices sometime in the future. According to Seth Kaplan, managing partner of Airline Weekly, falling oil prices are like moral hazard for airlines: “If it keeps trending lower, it totally changes the economics of the industry again”. Based on past behaviour, he further predicts that airlines may fly their planes in low demand periods because of the lower fuel costs associated with those extra flights. Returning to American Airlines, they have decided to launch flights at its Miami hub and Los Angeles, including overnight flights from Salt Lake City to Miami and from Los Angeles to Atlanta. In turn, Delta said it would start new flights from Los Angeles to Austin, Dallas, and San Antonio in Texas by Spring 2015. The falling oil price will also impact LCCs and FSCs differently. Airlines that already have strong cost disciplines typical of LCCs will find that falling oil prices may actually improve productivity elsewhere in the business model. With lower fuel prices, they can operate their planes for longer and leverage their cost advantage over the FSCs even further. By contrast, the FSCs may find the opposite, lower fuel prices may tempt them to offer more flights increasing their fixed costs without a corresponding increase in revenue due to the lower capacity usage of the planes on low-demand routes. In short, the LCCs operate a margin business model focusing on profits, whereas the behaviour of FSC executives, on the basis of past evidence at least, has been to focus on revenues or top-line performance. We have written in previous posts on this scurrilous activity of airlines posting charges called “fuel surcharge” and making it look like a government imposed charge. If fuel prices keep dropping— and fuel surcharges don’t —it is possible that regulators could intervene since the stated purpose of this ridiculous and anti-competitive practice is to reflect the volatility of fuel prices whereas in practice it is there to gouge revenue from customers in a highly opaque manner and to maintain profits/reduce losses without having to fight a price war with their competitors. Depending on the flexibility of their current fuel hedges, LCCs could look to expand their network scope and frequency and further leverage the productivity of their fleet since they have in-built lower cost structures compared to FSCs. All airlines that have hedged fuel prices should look to lock in new hedges as soon as practically possible. FSC executives should exercise discipline and not increase route networks and frequency into lower demand periods just because fuel prices are lower (and seemingly trending that way). Indeed, 2015 started really well for the…bankers. If we look at the whole economy though, would prices for city buses go down too? Or taxi rides? I think that the price stickiness is an immanent attribute of the overregulated industries.